This post is a tribute to St Patrick, the saint I’ve never met. Believe me, I always thought I would end up in Ireland, something to do with melodic Irish lilts – music to the ears of a young and naive undergrad. In my final year at University in Liverpool, I spent 3 months in Donegal, a region on the west coast doing geological fieldwork as part of my thesis. Sadly, I didn’t linger, thinking perhaps I would have another opportunity. After graduation, I spent the first 3 months waiting for a job offer from a research group based in Dublin. That didn’t work out and so I returned home to Nigeria and lived happily ever after. Still with a measure of hope that someday things would change and I would take up residence in the land of my dreams. And so, when Aoife of The Daily Spud (as Irish as they come……) sent up a call in arms to celebrate St Paddy’s day, rather than dye my hair an awful shade of green, I thought at first I would do nothing. But that was till I went to Houston. On a sunny Monday afternoon, my friend and I are walking the length of Memorial mall and I look on in a mixture of shock and awe. Shock because the exterior of the malls are simple, plain facades – unadorned with nothing more that the store names at the top and awe because inside the mall, I wonder if I’m on the highway. The ‘walkway’ lined on either side by stores and shops is wide, as wide as a ‘London street’ my friend says, laughing. I nod in agreement. 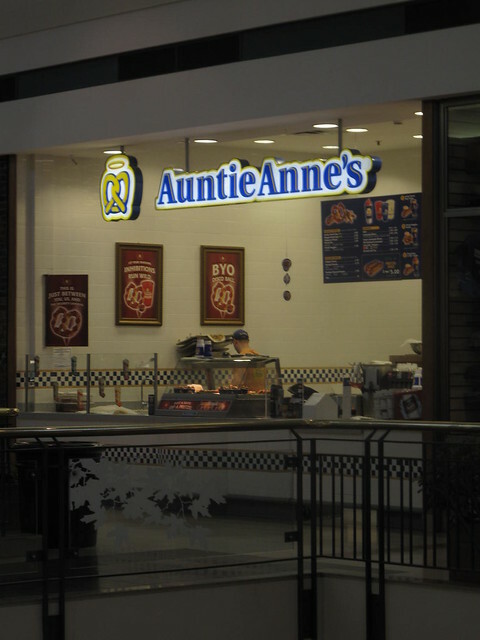 While we wonder and wander, my friend stops me and points to an Auntie Anne’s Pretzel stall, gushing about the delightfully soft, delicious pretzels. Concur? I’m sure you do. 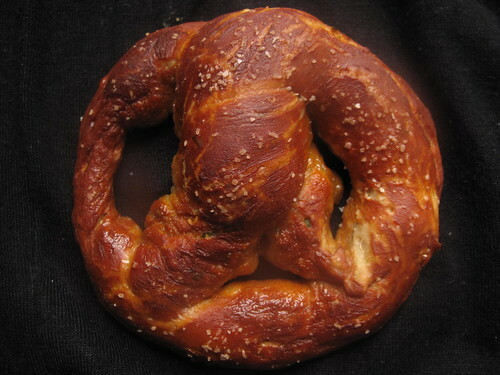 Of course, I had to try some, especially since I’ve never thought of pretzels as savoury. 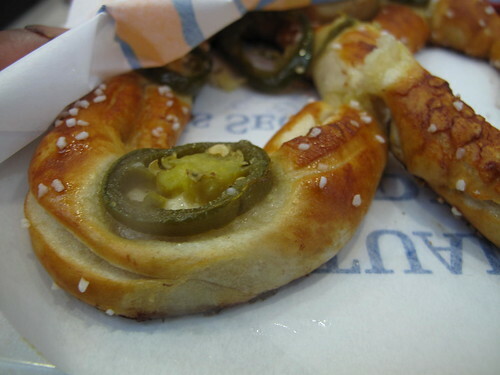 My choice is easy and when I bite into my green Jalapeno pretzels, I’m in heaven – soft, sweet, salty, spicy. I am stunned at how good they taste. Later on, I try a plain one but it is no match for the chile bake. And with a nod to myself I think and say ‘perfect for St Patrick’s Day’. 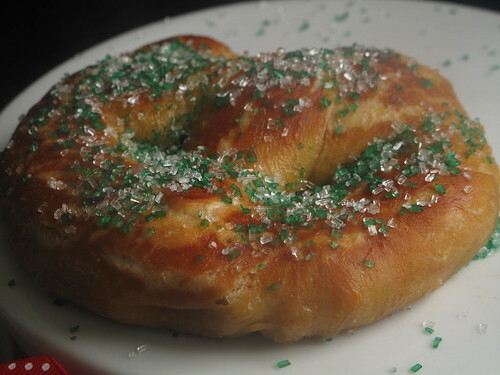 Finally the first batch of sweet pretzels are out of the oven and I loving bathe the tops with cinnamon powder and just-melted butter and finish off with very festive sprinkles. Daughter #1, relieved to finally have food on her plate eats one and a half of these gigantic pretzels. Daughter #2 takes the tiniest of bites and pushes her plate forward, distancing herself from it instead demanding a tortilla wrap with fried eggs and salsa. The shock to me was the only son’s reaction – he gets the largest, thickest pretzel and he sits down and in a manner so focused (and unusual for an almost 4- year old boy – moms with boys, do you feel me? ), proceeds to work his way through his ‘meal’. 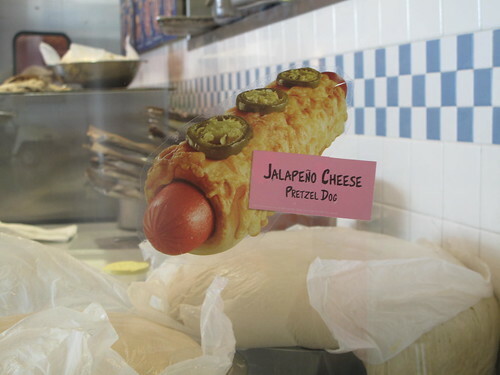 He eats all but a bit….and if I ever doubt the success of the pretzels, this turns me around. 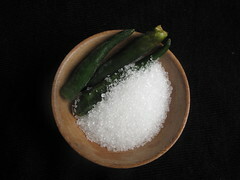 While I enjoy the soft, slight sweetness, it isn’t particularly tasty – not sugary or salty enough, but then I have not applied a salt topping. Anyhow, I progress onto batch 2 – the chile flavoured version. 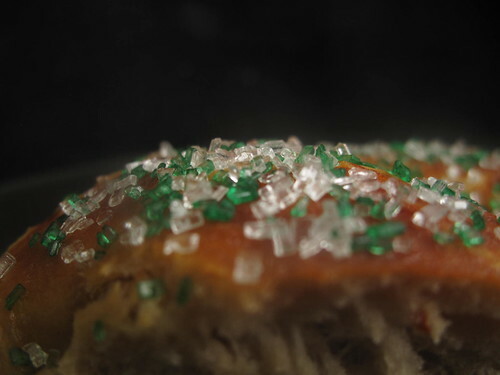 Everything goes well with these – they are sprinkled with some kosher salt before they get any blast of heat in the oven. They are baking very well when the phone rings. It is my mum and I’m catching up with her after a week away why my pretzels move from tan to golden to a burnt copper/bronze. Thankfully, I remember in good time and get them out of the oven before the transition to burnt black is made. As soon as they are cool enough, I take a bite and memories of my afternoon in the mall come rushing back. These pretzels, save for the colour are PERFECT in every sense of the word. 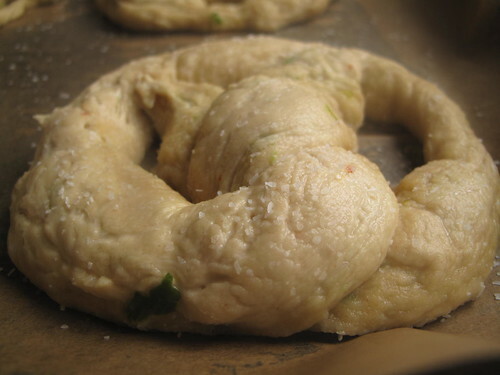 They are soft and springy, perfectly salted with a spicy kick from the chile peppers. 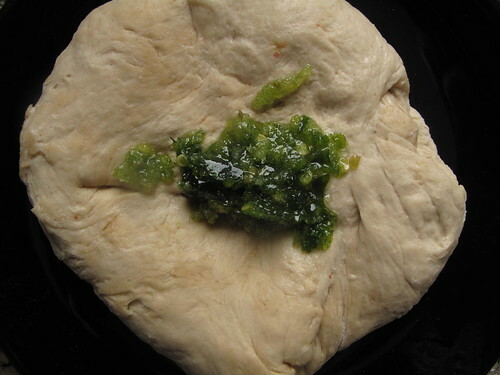 I’m almost amazed by the sweet warm heat and rounded flavor of green chiles. I love them, whether used in Thai green curry pastes, coriander chutney or pretzels. These I eat almost all alone (over two days). 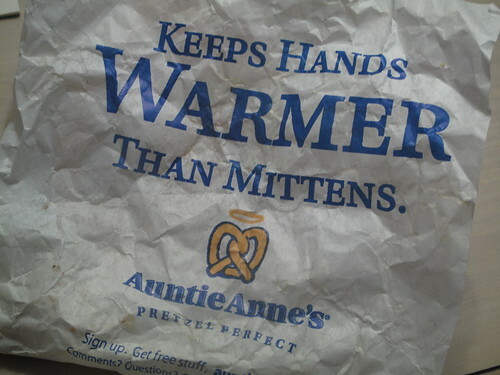 My husband likes them but has never really been a pretzel fan. 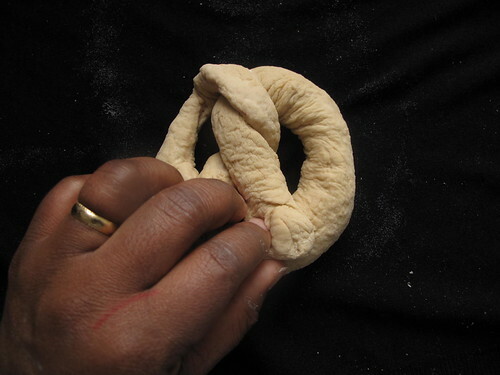 Without further ado, let’s raise our glass with/to Paddy and immerse ourselves in a delightful recipe, even if the shaping is not perfect, I now know what to do, so much so that I think I can handle bagels next! Put ½ a cup of boiling water in a large mixing bowl and add the butter and stir till it emulsifies. Then top up with a cup of lukewarm water. 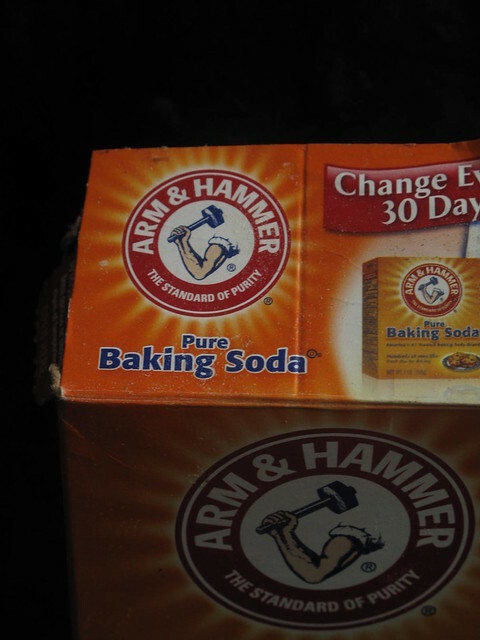 Prepare a clean surface and lightly dust with flour. 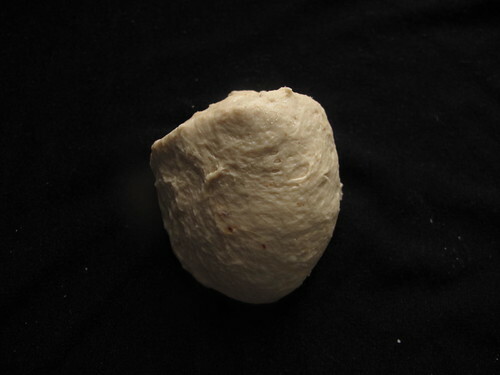 Turn the dough out and gently knead, then gather into a smooth ball. 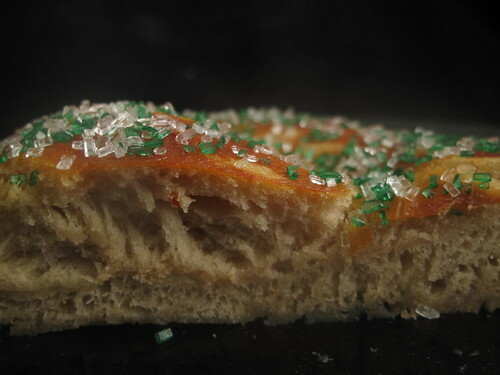 I split my dough into two batches – one half destined for sugar heaven and the other, chile paradise. 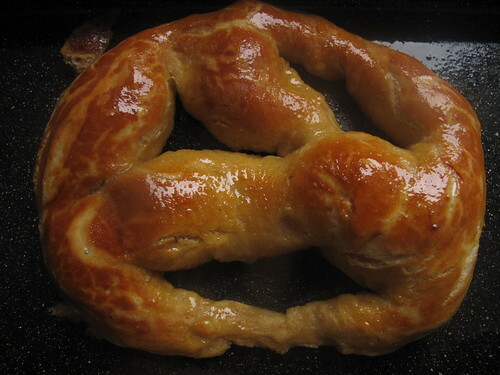 Then, for the sweet ones, I proceeded to shape, bathe and bake the pretzels. 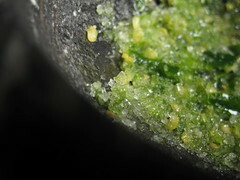 For the chile ones, I first made a chili paste of the green chiles, sugar and salt in my mortar and pestle. 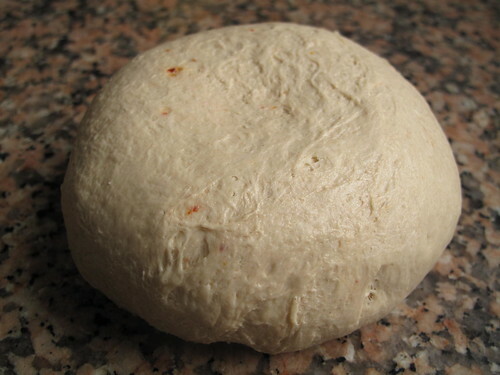 Then I kneaded the chile paste into the dough and proceeded to shape and bathe, as for the sweet ones. 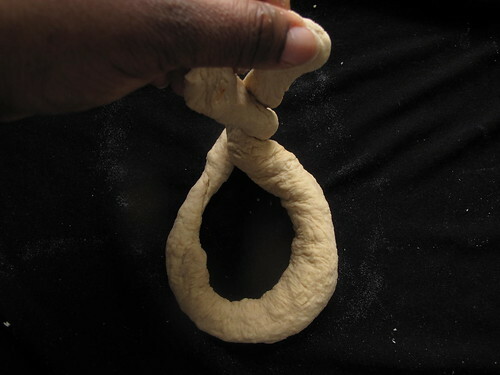 For each portion of dough, ball it and cut into 4 equal pieces. 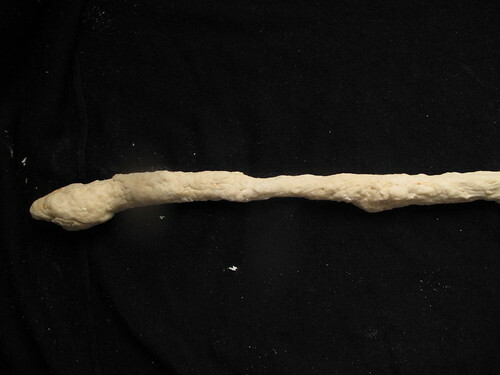 Then on a very lightly floured work surface, roll each piece into an 18-inch/56 cm long rope by pulling out the dough strip to stretch it out. 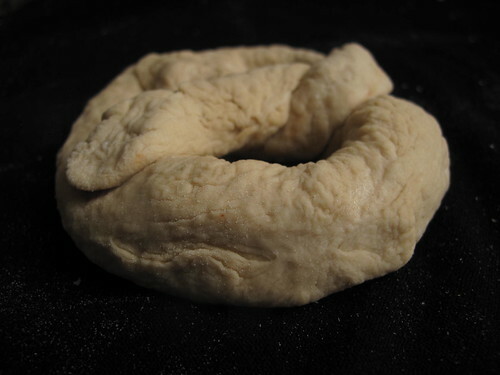 Start in the middle and move your hands outward while pulling, stretching, and rolling the dough strip, being careful to do this gently and not to over-work the dough. 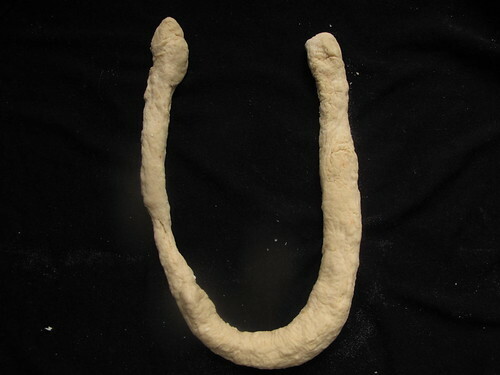 Shape dough strip into a “U” on the counter. Pull the end down to the bottom of the ‘U’ and then pinch to seal, about 2 inches apart. 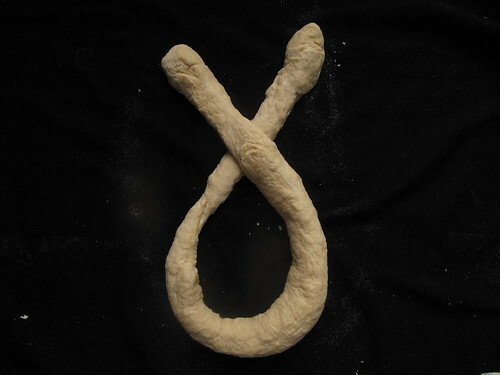 You should have your pretzel shape….even if that was the most difficult part for me! Feel free to experiment with other shapes, letters, or numbers; use your creativity! 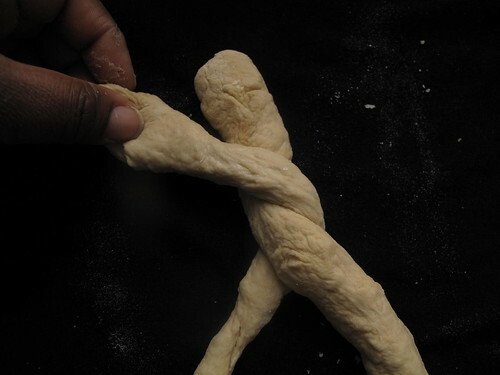 And enjoy the taste of growth….stepping outside the bread-making comfort zone. 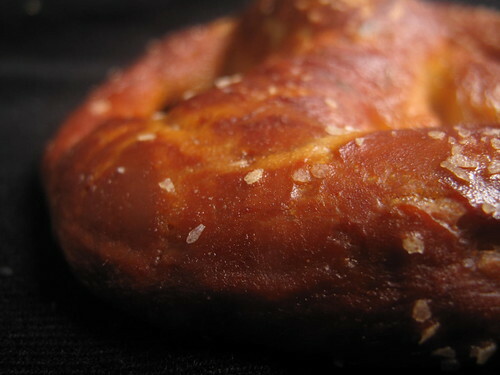 Transfer pretzels to an oiled baking sheet and let rest 20 minutes. After 20 minutes of resting, my sweet pretzels had visibly risen but the chile ones had not, all that was to change in the hot soda bath however. 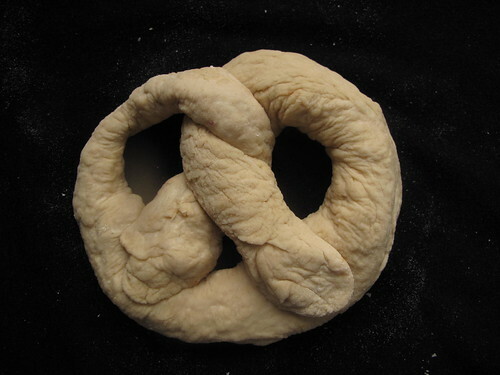 You will need to do the next steps in batches – pick up a pretzel by the pinched ends or use a large slotted spoon and dip into the baking soda solution. 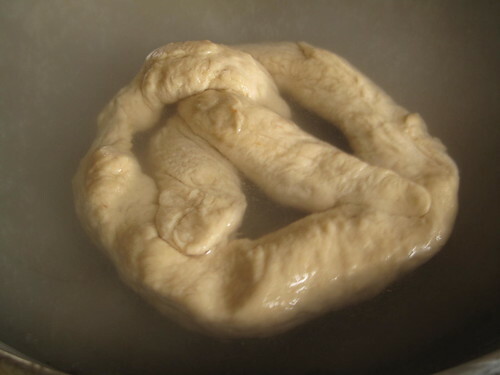 In batches, boil pretzels until puffed and slightly shiny, about 1 minute. Transfer to a wire rack with a slotted spoon, to drain. Repeat for all the others. 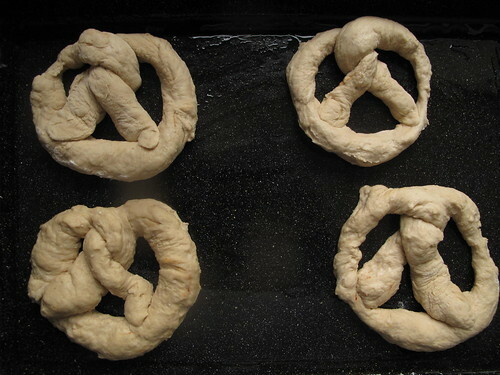 Then line the baking sheets with parchment or greaseproof paper, which prevents soggy bottoms and makes it much easier to get the pretzels off when ready (unlike just greasing the pans). 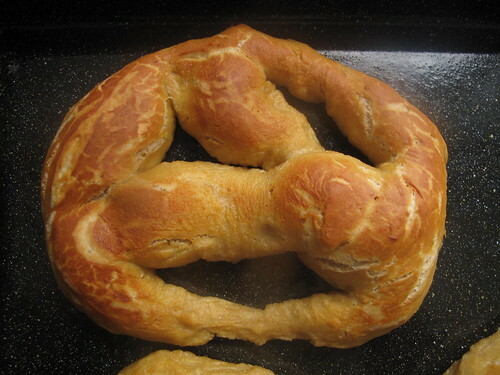 Place pretzels on baking sheet and sprinkle some salt (note I didn’t do this for the sweet pretzels but will do so in future). Once out of the oven, brush on some cinnamon spiced melted butter (or any other flavoured butters for that matter) and top with sugar sprinkles like I did, or tuck in straight….Serve warm or at room temperature. Keep at room temperature for up to 2 days, in a ziploc or in a covered bowl. 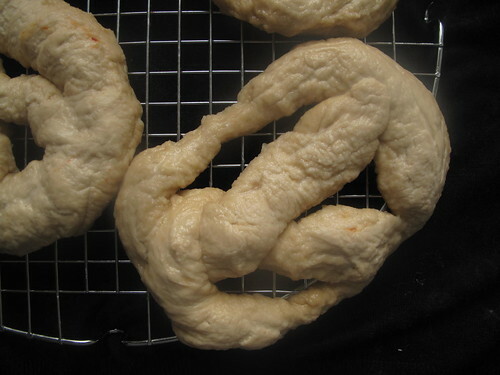 Auntie Anne recommends the following steps to recreating their famous cinnamon sugar variety: try melting a stick of butter in a shallow bowl (big enough to fit the entire pretzel) and in another shallow bowl make a mixture of cinnamon and sugar. 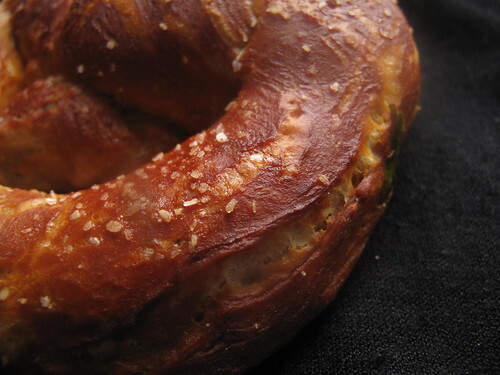 Dip the pretzel into the butter, coating both sides generously. Then dip again into the cinnamon mixture. Enjoy! Happy St Paddy’s day and more next week on Bucket List item #4: Go to America. Have a blessed weekend.